In the late 1700’s and early 1800’s, many Pennsylvania Mennonites extended the European Anabaptist migration by continuing farther north to what was then known as Upper Canada. Photo credit: The Pennsylvania German Folklore Society of Ontario. Beginning in 1786, Mennonites began migrating from Pennsylvania to what is now Ontario. Their route became known as the Trail of the Conestoga. They came in search of land. They also came to get away from the aftermath of the American Revolutionary War of 1776. The youngest members of the Jacob and Susannah Erb Brubacher family, A-74 Mary and A-76 John, great-grandchildren of the first Brubaker/Brubacher in the New World, A-1 Hans Brubacher, were among the Mennonite pioneers who migrated to Waterloo County to start new lives for themselves. Mary Brubacher married Benjamin Eby in 1807 and shortly thereafter they began their trek to Upper Canada. This couple was a part of the early Mennonite movement from Lancaster County to Waterloo County. Benjamin played a significant role in establishing the first church for Mennonite immigrants in Waterloo County. Benjamin was an ordained minister and bishop in the Mennonite Church. Ebytown, which was later called Berlin and then renamed Kitchener in 1916, was named after Benjamin Eby. Susannah Erb Brubacher’s husband, A-15 Jacob Brubacher died of Yellow Fever in 1793 at the age of 35. In 1809 widow Susannah journeyed from Lancaster County, Pennsylvania to Waterloo County in Upper Canada to visit several relatives, including her parents Christian and Maria Sherk Erb and her daughter Mary, all of whom had emigrated between 1804 and 1807. Susannah’s family played a significant role in the Mennonite settlement of Waterloo County. Susannah was a sister to Jacob Erb, John Erb who was the founder of Preston, and Abraham Erb who was the founder of Waterloo. These siblings were four of twenty-five major shareholders in the German Land Company that was formed in 1805 to purchase 60,000 acres of land in Waterloo County for Mennonite settlers. Susannah, the sole female shareholder, purchased ten lots, which she later sold to family members and other Mennonite settlers. Susannah’s youngest son, A-76 John Brubacher, traveled from Brubaker Valley in Lancaster County, PA to Waterloo County in 1815 in search of land. John selected Lot 57 (one of the lots owned by his mother), hired help to clear the land of its virgin forest, and returned to Pennsylvania to prepare for his move to Ontario. In 1816, Susannah accompanied John in his return to Waterloo County. They traveled with several other families and had twenty-eight horses pulling their Conestoga wagons. Their journey to Waterloo County took four weeks. When they arrived in Waterloo County, John and mother Susannah stayed with sister Mary and her husband Benjamin Eby until they had built a log cabin on present-day Frederick Street in Kitchener. John is said to have felled a tree and used the stump as a table. He then built his house around this piece of furniture. Susannah stayed with her son John for two years, until he married Catherine Sherk. 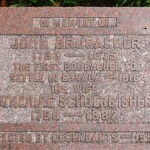 Grave stone of the first Brubacher to settle in Canada, John Brubacher (A-76) and his wife Catherine Sherk Brubacher, located in First Mennonite (or East End) Cemetery, Kitchener, Ontario. John and Catherine built several different homes in the area. The current addresses for where these homes were built are 520 Frederick Street and 65 and 67 Brubacher Street, Kitchener. John’s son Samuel (A-240) took over the family farm and the present-day Brubacher Street was originally the lane that led to the farm buildings. In addition, several of the streets in Kitchener are named after members of his family. Samuel Street is named after Samuel Jr., Lydia Street after his wife, Simeon was named after a son, and Edna was the name of Simeon’s daughter. 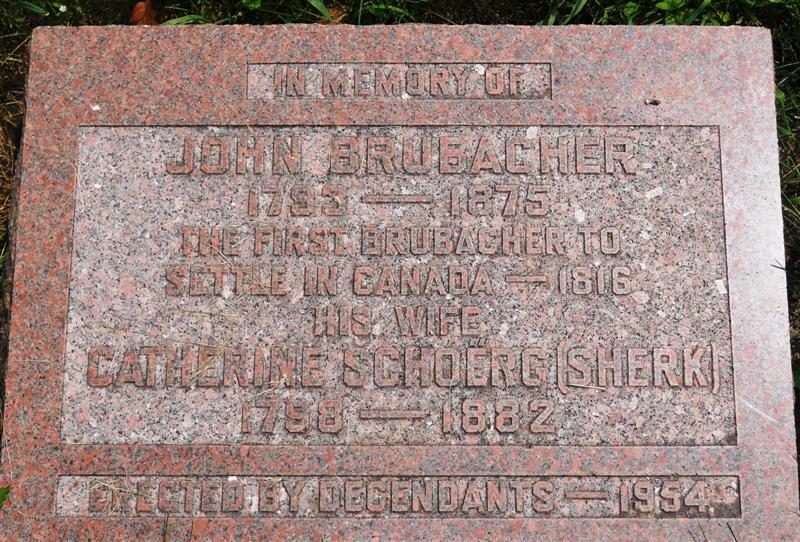 John Brubacher the father purchased Lot 25 of the German Company Tract in Waterloo County for his son John Brubacher. The stone house that son John and his wife Magdalena built on this lot is known as the Brubacher House Museum and still stands today as a reminder of the Mennonite pioneers that once farmed the University of Waterloo campus. 1. Brubacher, Jacob N. The Brubacher Genealogy in America, Mennonite Publishing Company, Elkhart, Indiana, 1884. 2. Epp, Frank H. Mennonites in Canada, 1786-1920: the History of a Separate People, MacMillan Publishing, Toronto, 1974. 3. Gibble, Phares Brubaker. History and Genealogy of the Brubaker, Brubacher, Brewbaker Faily in America. Eastern Pennsylvania Brubaker Association, Lititz, PA, 1951, 1979. 4. Global Anabaptist Mennonite Encyclopedia Online Eby, Benjamin (1785-1853). 5. Global Anabaptist Mennonite Encyclopedia Online Waterloo County (Ontario, Canada). 6. Hunsberger, Paul. Ancestors & Descendants of John E. Brubacher and Magdalena M. Musselman, Paul A. Hunsberger, Goshen, Indiana, 2005. 7. Martin, Janelle. “Brubacher Family: Early Settlers in Waterloo County.” Mennonite Heritage Portrait. 8. Martin, Maurice. “Meet Me at the Grand.” Canadian Mennonite Magazine Online, March 21st, 2011.